- Creates silky-smooth and great tasting water that is refreshing to drink. - Helps filter out chlorine and other contaminants. Permanently absorbs metals such as lead and copper. - Reduces limescale which, if used in domestic appliances, will prolong their life. - Increases active hydrogen. - Creates pH 8.5-10 water to help support systemic pH balance in the body. (Typically increases pH by 2 or more points). - Provides low negative ORP: -100mv to -300mv. This transforms ordinary water into rich antioxidant water to help energise and revitalise your body. - Reduces water molecule size to create more absorbable water to increase hydration. 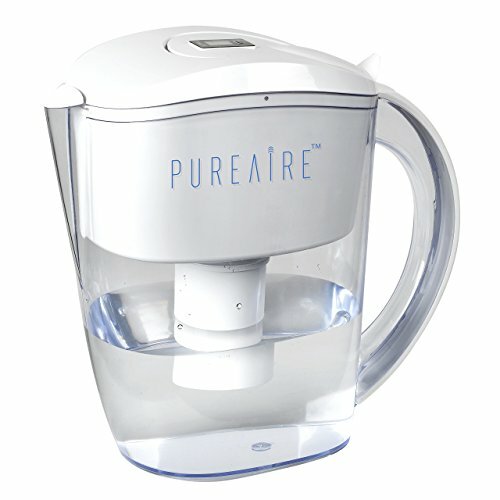 The PureAire alkaline water pitcher transforms ordinary tap water into antioxidant rich water to help energize and revitalise your body. Creates silky-smooth and great tasting water that is refreshing to drink. Helps filter out chlorine and other contaminants. Permanently absorbs metals such as lead and copper. Reduces limescale which, if used in domestic appliances, will prolong their life. Creates pH 8.5-10 water to help support systemic pH balance in the body. (Typically increases pH by 2 or more points). If you have any questions about this product by PureAire, contact us by completing and submitting the form below. If you are looking for a specif part number, please include it with your message.